The Filquip Hepa Filter air intake box is the ideal solution for providing clean air into your plant equipment process. 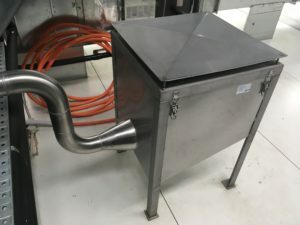 Developed for Fan and Vacuum Conveying intakes in industrial food processing plants the housing box is made from Stainless Steel with a pre-fitted outlet pipe spigot as requested by the customer. This pre-filter and hepa-filter system provides an extended life with greater than 99.99% Efficiency at 0.3 Micron.